IT WAS a dream come true for 17 local kids from underprivileged families in the Brunei-Muara District when they left the country on Thursday to the Republic of Korea. Their first time on an aircraft, the children are on a sponsored field trip to Korea, a courtesy extended by Sinar Tour Sdn Bhd who organised the trip with the support of the Korean Embassy in Brunei Darussalam, Royal Brunei Airlines (RB), Sinar Holdings, Dongwon Food and Beverages (Korea), At-Taqwa Travel Tours Sdn Bhd and Aewon Company. The 11 to 16-year-olds are currently undergoing a special programme tailored to enhance their skills and talents to help them become successful in the future. In an interview, participants Nur Amalia Mahirah binti Mohd Ridwan, Nur Azira binti Hazman and Noja Ain Maizurah binti Jaini expressed their excitement to be on a plane for the first time. “This is my first time on a plane and I feel a bit nervous yet excited,” said Nur Amalia, a secondary school student. Nur Azira added, “I can’t wait to go to Korea. We always see Korea in dramas. Now, I can really experience Korea for myself. VISITORS from Kuala Lumpur, Malaysia in the first At-Taqwa Inbound Group Tours arrived at the Brunei International Airport (BIA). Offering a four-day package from August 11 to 14 for about 25 people, the package aimed to boost the tourism industry in Brunei as well as promote the local programme ‘Kenali Negara Kitani’ (KNK, or Know Our Country). SOME 100 corporate clients, customers and invited guests attended the At-Taqwa Travel Tours Eid Mubarak open house yesterday at the At-Taqwa Office, Tungku Link, Rimba, Gadong. At-Taqwa Chief Operations Offi-cer Haji Shamsul Baharin bin Haji Abdul Rahman shared that it was the second time At-Taqwa hosting the open house. The event aimed at showing appreciation towards its clients and business partners for their support over the years and also to provide an opportunity to interact with clients and acquire some feedback to improve the agency’s services, he added. 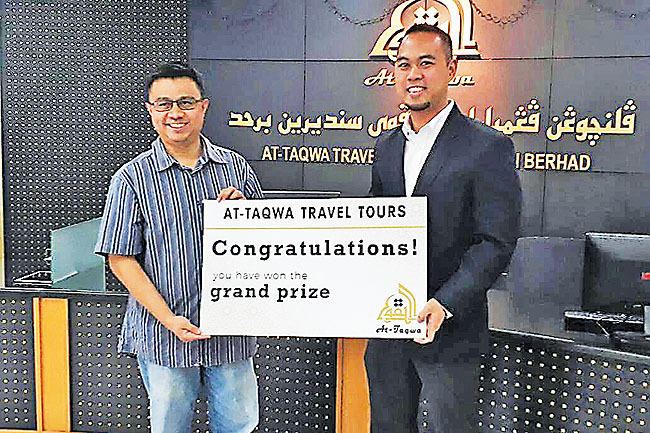 A PRIZE presentation ceremony was held yesterday, for the customers of At-Taqwa Travel Tours who had bought tickets at the Sabre Brunei Travel Fair on September 2-4, 2016; and the Royal Brunei Airlines (RB) Belait Travel Fair on March 4-5, this year. The grand prize of an Umrah package was won by Azmin bin Dato Seri Laila Jasa Haji Ahmad. Tajul Rizal bin Zainal Abidin won the second prize of air tickets to Kuala Lumpur, while Roziana binti Kahar took the third prize of a four-day stay at The Rizqun International Hotel. The fourth-place winner was Hajah Masrurah, who won a Fitbit Blaze watch. The prizes were presented by Pengiran Fakhrulrazi bin Pengiran Haji Omarali, the Head of the Haji and Umrah Department. Among those in attendance were Pengiran Haji Rosdimar bin Pengiran Haji Omarali, the Managing Director of At-Taqwa Travel Tours; Awangku Mohd Nassiruddeen bin Pengiran Haji Yussof, the Chief Financial Officer; Haji Shamsul Bahrin bin Haji Abdul Rahman, the Chief Operating Office; and also representatives from RB and Sabre Brunei. At-Taqwa Travel Tours’ third participation in the travel fair roadshow highlights the company’s progress in the highly competitive travel segment, during which 482 air tickets were purchased.